This rouladen recipe, aka Rinderrouladen, is similar to the traditional rouladen (beef rollups) made throughout Germany, however it uses a pressure cooker. In my case, it's an Instant Pot. Pressure cookers are commonly used in Germany, however, I haven't had one for years! The last time I had a pressure cooker was about 35 years ago. You know, the type that makes a mess on the ceiling! My Facebook fans let me know that the modern ones are very, very safe and so much easier to use than the old ones. This is the one that they recommended the most: the Instant Pot Duo. On Amazon, it has over 18,000 reviews at 4.7 out of 5 stars! How could I buy anything else? Now, it's my new toy, I mean, tool, that I'm having so much fun with converting my German recipes. This Instant Pot Duo combines 7 kitchen appliances in 1: Pressure Cooker, Slow Cooker, Rice Cooker, Steamer, Sauté, Yogurt Marker and Warmer. I can't believe I lived most of my life without it! Season beef slices with salt, paprika, and freshly ground pepper. Thinly spread mustard on top of each slice. Chop one onion. Cut one carrot into strips. Cut pickle in half lengthwise. Divide chopped onion, carrot strips, pickles, and bacon strips on one end of each roulade. Roll up slices (think 'burrito'), tucking the ends in and securing with skewers, wooden cocktail picks, or thread. Set Instant Pot (IP) to sauté. Once hot, add butter (or oil), about 4 Tbsp. Brown rouladen well on all sides. Once the rouladen are browned, remove to a plate. Remove most of the fat from IP. Slice remaining onion. Add to the IP. Add carrots and celery. Lightly brown vegetables. Add tomato paste. Add beef broth or water (and wine, see below), stir to scrape up brown bits from bottom of IP. Return rouladen to IP. Seal pressure cooker and set to Manual for 20 minutes and use Natural Release. Remove rouladen and keep warm. Set IP to sauté. Make gravy by either blending the cooking liquid with hand blender and thickening with about 1 - 2 Tbsp cornstarch dissolved in a bit of water. Alternatively, sieve out vegetables and thicken. Or just thicken as is. Season gravy to taste with salt and freshly ground pepper. If you wish, add sour cream to gravy. Remove skewers, picks, or thread to serve rouladen with their gravy. 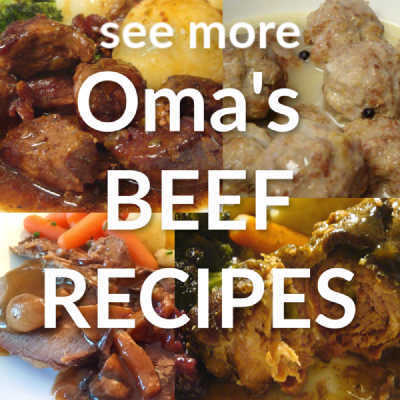 Have butcher cut beef top round into thin slices, about ⅜ inch thick. Each roulade should measure at least 6 inches by 4 inches. Gently pound meat until it is about ⅛ to ¼ inch thick. Be careful not to put holes in meat. The larger the roulade, the easier it is to roll up. Replace ½ cup of the water or broth with red wine. For my traditional rouladen recipe, check out German Beef Rouladen. 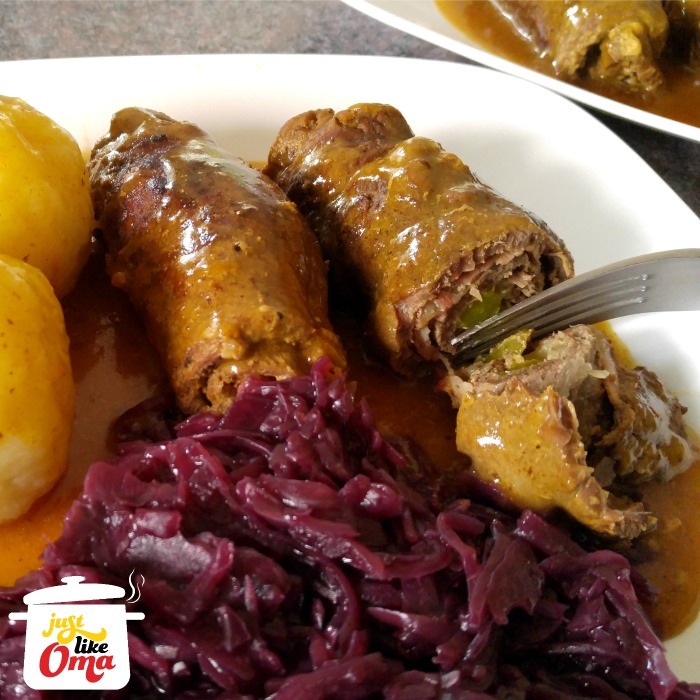 These German beef roulades are great dinner idea for special occasions. They do take a bit of time to prepare. HOWEVER, if you want to have these same flavors in a less expensive and a much quicker recipe, then check out the Flatladen recipe I created. It has all the flavor of rouladen, especially the wonderful gravy ... but it's perfect for a week night meal! My family LOVES this! What is served along side? For us, it's usually potato dumplings and red cabbage. Sometimes, I'll make boiled potatoes and baby carrots or mixed veggies, when it needs to go fast. "It is safer to meet a bear robbed of her cubs than to confront a fool caught in foolishness." This Rouladen recipe is what I make when I'm in a hurry by using my pressure cooker (Instant Pot). The meat is so tender!! !